Jet Set Smart: FASHION FRIDAY: WHERE IN THE WORLD IS YOUR HEART? On this blog, you'll find my ideas on where to jet set, but from time to time, you'll get my recommendations about interesting fashion ideas from around the globe as well. I recently learned about a fabulous jewelry designer from California named Maya Brenner. 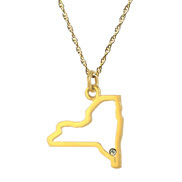 She creates everything from necklaces, to earrings, to bracelets...But, I absolutely fell in love with her State Necklaces. They come in either sterling silver or 14K gold, and you can also get them with or without a little diamond (Around $100-$300 depending on which state). Many celebrities have sported them, including Eva Longoria-Parker who says she wears hers (state of Texas) because no matter where she is in the world, "her heart is in Texas." Obviously, my heart is in New York, so that's the one I want. I can jet set anywhere now, and bring a bit of my hometown along with me! You can find Maya Brenner jewelry at finer boutiques in the U.S., the UK and Japan, or on her website.